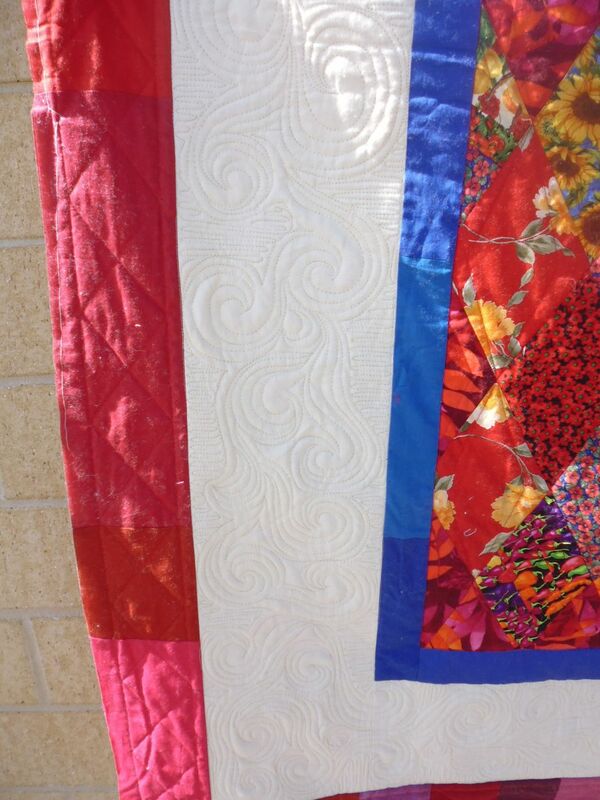 This was a BRIGHT quilt top! I started by stitching in the ditch around the centre diamonds (and found out not all were diamonds…), then the borders. As the centre panel was so bright and busy, I just did a simple angled straight line in the centres of each diamond (in red thread), filling in the diamonds in every second row with a filler design. What to do with that expanse of cream fabric in the large border? I decided to try something new — a motif I’ll now call ‘Blowing in the wind’ as it reminds me of swirling winds. I stitched a sweeping line/S curve out to a curved pointed end, then echoed a couple of times, then started a new sweeping curve. Once I’d finished them all, I echoed around the entire design, then did a perpendicular up/down filler to make the wind swirls ‘pop’. I quite liked the effect and will add this to my repertoire. It was pretty easy to do and didn’t take long. 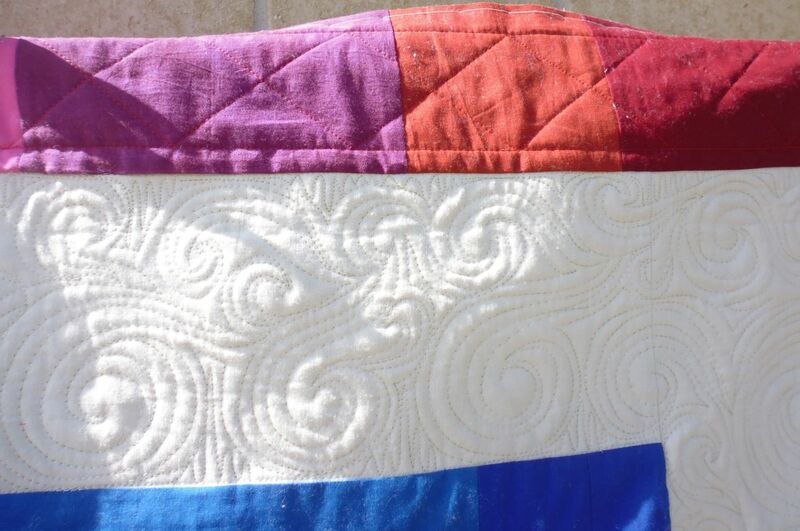 For the outer border, I echoed stitched about a half inch away from the seam, and then marked the width of my Line Tamer ruler from that stitched line and stitched another line to give me a space to work in. I then measured and marked approximately every 4″ across the length of each border between those stitching lines, and created diamonds from them, reflecting the diamonds in the centre panel. I very much like that swirling “Wind” pattern/combo. The texture created is wonderful. Love that “Line Tamer”!!!!!!! Nice work!!!!!!!!!!!!!!! !